We here at Maine Camp Experience and our incredible 31 summer camps have decided that this is the summer of “Do Something.” We want to highlight and further encourage social action and responsibility with our campers, so many of our camps will be participating in cause-minded events while partnered up with DoSomething.org. It’s an exciting prospect for both campers and camps, and we’ll be keeping you posted all summer long about what’s going on! Here’s how it works. Campers will bring their used or already worn sneakers with them from home and their camp will have a place for them to “dunk” their “kicks” to take a stand against pediatric cancer. A substantial amount of the monies that the Max Cure Foundation receives from an international recycler will go towards advancing their mission – it’s that simple! Since launching this program in February of 2012, The Max Cure Foundation has collected over 30,000 pairs of sneakers of which more than $30,000 has gone directly to families across the country, all of whom have a child with cancer. The sneakers typically end up in land fills, and it can take up to 500 years to decompose. With Dunk Your Kicks the sneakers are recycled and refurbished, then they are sold as affordable footwear. Today they are in developing nations on the feet of others less fortunate than us. All sizes are welcomed but they must be athletic footwear and not cleats. 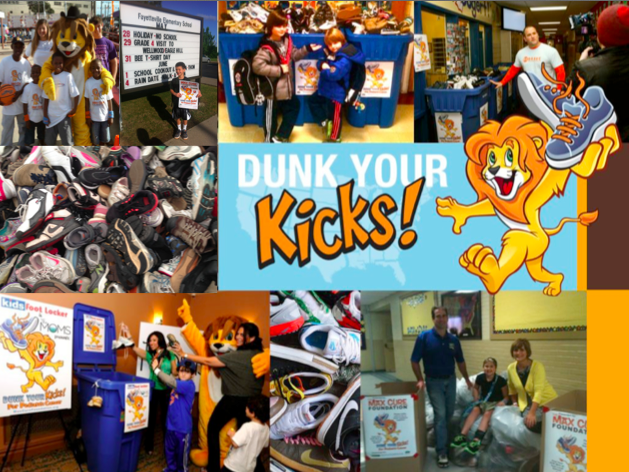 This year they hope to collect 500,000 pairs , or get 500,000 dunks – let’s help them get there! Max Cure founder (and Maine Teen Camp alum!) David Plotkin will be up in Maine at the start of camp this summer to kick off the program and talk to some of our campers about social action, and we’ll hopefully be sharing piles of pictures of piles of sneakers before the summer is out. If you or your camper can donate used sneakers – pack ‘em in the trunk! Put ‘em in the carry-on bags! Send ‘em in the mail! Just get ‘em up to camp so we can all do our part to beat pediatric cancer. MCE partners Camp Trucking and Camp Baggage will be helping us transport all those collected sneakers to Max Cure Foundation – let’s make sure their load is heavy. Contact your directors for more information and to see how your camp plans to handle Dunk Your Kicks.